This Sunday, I made a mistake on national TV. Ain’t that just the absolute worst kind to make? During a discussion on CNN’s “Reliable Sources” about Michael Moore’s throw-down with CNN over “Sicko,” I mentioned a headline I’d read about Moore complaining that the iPhone’s release had cut down on his buzz. I mentioned it off-handedly, as a goofy example of Moore’s extreme self-absorption, which I think is his chief motivation in picking a fight with CNN. Heck, I think it’s his chief motivation for filmmaking, period. It was a headline I’d seen a couple times throughout the week, repeated on several Web sites, with quotes from Moore. But here’s the thing. Moore may be self-absorbed, but he has no beef with the iPhone. Instead, the headline I’d seen belonged to a piece of satire produced at Liquid Generation. Moore never complained about the iPhone killing his buzz. I failed to click through, read thoroughly, and verify the story, and mentioned the headline without thinking it through. It was entirely unintentional and careless, and I regret the misrepresentation. I hereby publicly apologize to Michael Moore for it. I certainly did not wish to fudge the facts about Moore when talking about his own famous tendency to fudge the facts. It’s an unfortunate irony, but there it is. It was one sentence in a 12-minute interview, and one mistake among many facts about Moore, but I am sincerely sorry for it, and wished to correct it here, because that’s what you do when you make mistakes. I have no wish to paint Moore as self-involved and dishonest through any sort of subterfuge. Nor do I have any need to. He provides all the ammo anyone would need. Meanwhile, the hotter fight’s still roiling between CNN and Moore, and CNN is on the offensive, answering 10 of Moore’s characteristically unsound criticisms in a rebuttal to his open letter. CNN rolled a taped segment with Dr. Sanjay Gupta, their resident neurosurgeon/medical reporter, in which he presented some of Moore’s figures and conclusions alongside some conflicting figures and conclusions based on the record of universal health care around the world. He also conceded Moore’s broadest point—that Americans are dissatisfied with the current state of health care and ready for a fix. The tone of the piece was skeptical, but not mean-spirited, and Moore was given a chance to respond at length after the segment ended—which he did, with gusto. war of lies back in 2003. Sensing that the gettin’ was good on publicity, Moore appeared on “Larry King Live,” launched attacks on Gupta on his Web site, and published an open letter to CNN, promising the network he'd become its “worst nightmare.” Apparently the documentarian is also well-versed in hackneyed, machismo catchphrases of American cinema, too. "In our original report, we made one mistake, which we apologized for and corrected on air and online six days ago, despite Mr. Moore's claim yesterday in his letter to us. Further, the e-mail Mr. Moore released in an effort to cast doubt on our reporting does no such thing." I’m sure Michael will keep on talking, as he always does, but he certainly won’t be saying what needs to be said. When you make a mistake, you correct it, and apologize. Let’s run over a few of Moore’s “mistakes,” all of which are parts of his carefully edited and highly visible documentaries. All the while, the filmmaker, Michael Moore, has been trying to see Roger Smith. He arrives at GM world headquarters in Detroit and is immediately escorted out of the building. He then shows up at the GM board meeting and is removed from the audience's podium. He attempts to track down Roger's estate in Bloomfield Hills, but to no avail. From the Yacht Club to the Golf Club to the Hunt Club, Moore takes us on a tour of the havens of the rich and powerful in his seemingly futile, but finally succesful [sic], attempt to talk to Roger Smith. First off, Moore’s actually from Davison, a suburb of Flint, but that’s small potatoes. The real “mistake” is that the entire movie is predicated on the fact that Smith wouldn’t submit to an interview with Moore—that he had to be stalked and ambushed into facing the facts about Flint. Problem is, Smith did submit to an interview with Moore. Two, in fact, of some length, of which there are transcripts, videos and witnesses, but no clips in the film. Fellow documentarians Rick Caine and Debbie Melnyk found that out while filming “Manufacturing Dissent,” a 2007 documentary about Moore. We spoke to Jim Musselman, a former activist for Ralph Nader who was organising the community of Flint to fight back against General Motors and claims that Moore did question Smith for 15 minutes during a General Motors expo at the Waldorf-Astoria in New York. "He sat there and answered questions for about 10 or 15 minutes," says Musselman, who told us that he had watched the footage himself, in the edit suite. "It was great footage because it was Smith answering questions one-on-one from Michael." Then I found an article from a 1990 issue of Premiere magazine in which several people, including Nader, asserted that Moore had also filmed an exchange with Smith at a 1987 General Motors shareholders meeting; that was reportedly left out of the film, too. The magazine published a transcript of the exchange, which was mostly about taxes. Caine and Melnyk, both self-described Canadian liberals, started out to make a laudatory film about the documentarian’s documentarian. Instead, they found the real Michael Moore, who makes up facts where it pleases him, and assiduously avoids the types of interviews he demands of others. Then there’s "Fahrenheit 9/11." It took a whole other documentary to set right the misleading statements in that film, and one document alone lists 59 deceits in the movie. But do you know the story of Sgt. Peter Damon? The Iraq veteran lost both arms in a helicopter explosion, and appeared in Moore’s paean to Bush-hate without his knowledge. Damon was recuperating at Walter Reed when he was told “NBC Nightly News” wanted to interview him for a story about painkillers and recovery. It's a powerful moment in Michael Moore's anti-war film Fahrenheit 9/11. A young American soldier who lost his arms in a helicopter explosion is describing his injuries. The soldier, Sergeant Peter Damon, says he feels like he is being "crushed in a vice". Painkillers, he continues, "take a lot of the edge off of it". The scene follows a clip showing the Democratic congressman Jim McDermott criticising the Bush administration's conduct of the war in Iraq. "You know, they say they're not leaving any veterans behind, but they're leaving all kinds of veterans behind," the politician says. "They took the clip because it was a gut-wrenching scene," Sgt. Damon later told the New York Post in an interview. "They sandwiched it in. [Moore] was using me as ammunition ... I was complaining about the pain I would've been having. 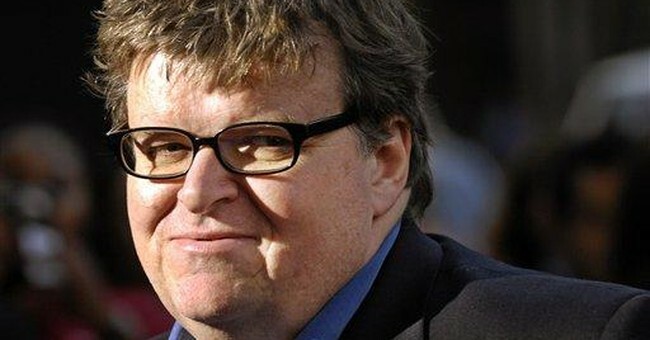 I just want everybody to know what kind of a guy Michael Moore is, and what kind of film this is," he said. In 2006, Damon sued Moore for $85 million for using the interview without permission, “loss of reputation, emotional distress, embarrassment, and personal humiliation.” His lawyer claimed they had tried to come to an agreement with Moore for more than a year with no results. "Well, he filed it against NBC and the film company and everybody else was named because it was NBC that interviewed him. I didn't interview him. We just bought archival footage from NBC, so we got kind of dragged along into that," [Moore] said. "I don't know what else to say about that, other than I'm appreciative of his service to our country and I wish him well in his recovery." In this column, I’ve mentioned only two of Moore’s more obvious breaks with the truth. The sheer volume of his misstatements has spawned a cottage industry of fact-checkers. When Moore critics, like myself, make mistakes, they usually correct the record and apologize. We all make mistakes. Moore has made a career of them.